Citizens in Busan Metropolitan City, the nation’s second-largest city, with a population of 3.56 million, were shocked in 2012 when the city came behind Incheon in a global survey to measure its competiveness. Incheon was ranked 56th, while the survey put Busan at 64th. The Economist Intelligence Unit conducted the survey on 120 cities in the world to address emerging city power. “City policymakers took the survey results seriously and started considering how to boost the city’s competitiveness and turn it into a destination for companies and travelers,” Kim Kyung-soo, a researcher at Busan Development Institute, said. More precisely, the wind of change arrived in Busan, once an isolated city located on the southeastern-most tip of the Korean Peninsula, in 2010. At the time, the central government lifted a development ban on 33 square kilometers of greenbelt area, located in the western part of the city. The deregulation measure stepped up the development of the Busan-Jinhae Free Economic Zone, or the BJFEZ, partially located in the greenbelt. Despite the distance from the capital, the BJFEZ that began construction after its designation in 2004 has been attracting global export-driven high tech companies with its logistics advantage. The business zone is close to Busan’s New Port, the nation’s largest seaport and Gimhae International Airport. “The inflow of companies overtook the outflow of enterprises in 2010,’’ Kim said. Busan is becoming a destination for travelers. The city was the second most favored Korean city to visit for Chinese travelers after Seoul last year. Haeundae-gu, an eastern district of Busan, is flooded with Chinese visitors year round. Haeundae beach, sitting against the backdrop of high-rise buildings, and Shinsegae Centum City, a mega shopping complex that includes the world’s largest department store, are located within the district. The Busan Exhibition and Convention Center is emerging as a hub for a variety of business meetings and trade shows. Continued updates of the city in terms of infrastructure and soft power are attracting not only companies but also people. “The population in Busan and its satellite cities like Gimhae and Yangsan is growing, beating the outflow of people,” a city official said. 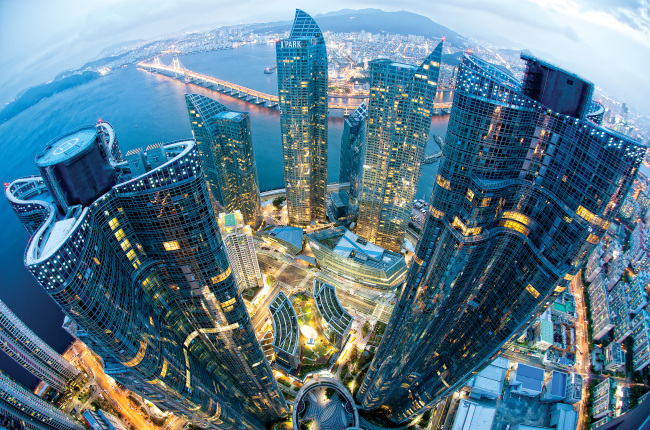 Busan’s competitiveness has improved, but it takes some time to gain the status of an international city, experts said. “It is time for the city government to bolster the city’s soft power rather than update hard power like infrastructure,” Kim said. Secondly, more investment in city branding activities is advised to raise awareness of the city internationally. “Busan has created a couple of globally competitive festivals, including Busan International Film Festival and Busan Fireworks Festival, but the international awareness of these festivals is quite low due to the lack of a strategic approach to promotion,” Kim said. Cultural openness was stressed as another key factor for becoming an international city. “Citizens of Busan, where conservative Confucianism is deep-rooted, need to learn more about different culture and to increase global connections, in an effort to become a part of the global network,” Kim added.